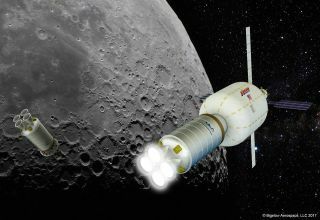 A privately built space station could be in lunar orbit by 2020 to serve as a refueling depot for other spacecraft as depicted in this artist's illustration from space-habitat manufacturer Bigelow Aerospace. Giant space-station refueling depots could be orbiting the moon by 2020, but only if the Trump administration makes the funding and national drive needed for it to happen a priority, according to aerospace entrepreneur Robert Bigelow. Bigelow, whose company, Bigelow Aerospace, has launched three private space-habitat prototypes into orbit — including the first inflatable space-station module, said that a commercial station in lunar orbit would be a vital destination for moon exploration. Bigelow spoke with Space.com just days after the private spaceflight company SpaceX, founded by billionaire Elon Musk, announced that it will launch a private flight around the moon in 2018. On Feb. 26, Musk told reporters SpaceX had "significant deposits" from two as-yet unnamed individuals for a private trip around the moon aboard the company's Dragon crew capsule. The flight will launch on SpaceX's new Falcon Heavy rocket, which is scheduled to make its first test flight later this year. "SpaceX has indicated that they can provide transportation for a circumlunar flight by 2018," Bigelow said. "If the timeline is met, SpaceX would be in a position to offer commercial transportation to the moon by 2020." Last week, another space entrepreneur — Amazon's billionaire founder Jeff Bezos — told the Washington Post that his private space company Blue Origin is eyeing its own plan for moon-bound spacecraft and a lunar lander. This illustration depicts a Bigelow Aerospace BA-330 space habitat in orbit around the moon, where it could serve as a waystation for astronaut crews and a refueling depot for visiting spacecraft. Bigelow himself has often said that private space stations and habitats for the moon and beyond have been goals for his Las Vegas-based Bigelow Aerospace. Last Wednesday (March 1), Bigelow unveiled his company's concept images of a lunar depot on the way to the moon, and in lunar orbit. "We are pleased, so far, with the performance of the spacecraft," he added. Bigelow Aerospace has also teamed up with the United Launch Alliance, a launch-providing partnership of Boeing and Lockheed Martin, to launch a colossal inflatable space habitat into orbit in 2020. That spacecraft, called the BA-330 for its 330 cubic meters (or about 11,650 cubic feet) of internal volume, would launch on a ULA Atlas V rocket and expand in orbit to serve as a free-flying private space station. "The BA-330 is three times the size of anything on the ISS," Bigelow told Space.com, adding that the company aims to be able to provide the habitats at a fraction of NASA's cost. This artist's illustration of a Bigelow Aerospace BA-330 habitat on the way to the moon, powered by two United Launch Alliance ACES rocket stages. Bigelow said that a BA-330 habitat could potentially be placed into a low-lunar orbit using two of ULA's upgraded Centaur rocket stages, known as ACES (Advanced Cryogenic Evolved Stage). The space station would orbit somewhere between 100 and 150 kilometers above the moon, serving as a gateway for astronaut crews making their way to or from the lunar surface. The BA-330 could also be a fueling station for other spacecraft operating near the moon, something that will be essential for the permanent settlement of the moon, Bigelow said. "You'll be able to give the astronauts a waystation, a place where they can have the experience of being farther from Earth than anyone has been in the last 45 years," he added.